პირველი ვორკშოფი 19 ოქტომბერს, საღამოს 6 საათზე. ეს პროექტი არის მარტინე ნედამის (საფრანგეთი, ჰოლანდია) რეაქცია დღევანდელ ქართულ სიტუაციაზე, საიდანაც ყველა ახალგაზრდა მხატვარს საზღვარგარეთ წასვლა უნდა. მხატვრები მიდიან, მარტინეს კი უნდა ჯგუფური მუშაობის შედეგად შექმნას ახალი, ვირტუალური მხატვრები გეოეარის არქივში არსებული ინფორმაციის გამოყენებით. გეოეარის რეზიდენციაში მარტინე ნედამის პირველი ნაბიჯი იქნება ადგილობრივ სახელოვნებო სივრცეში მომუშავე ხალხთან დაკავშირება, ესენი იქნებიან მხატვრები, სტუდენტები, ხელოვნების მოყვარულები. ასევე ინტერნეტ კომუნები, ბლოგერები და სოციალურ მედიაში მომუშავე ხალხი. დაინტერესებულ პირებს შეეძლებათ ამ პროექტისთვის მატრინეს გაკეთებული ინტერფეისი გამოიყენონ. http://virtualperson.net არის ვებ გვერდი, რომელიც მან 4 წლის წინ შექმნა. ამ ონლაინ მექანიზმის მეშვეობით შეიძლება შეგროვდეს ტექსტები და სურათები რათა შეიქმნას ვირტუალური პერსონაჟი (virtual character). ეს ადვილიად გამოსაყენებელი ინტერფეისი მისაწვდომია ყველასთვის ვინც კომპიურეთან თავისუფლად მუშაობს. მარტინე ნედამი ჩაატარებს რამდენიმე ჯგუფურ ვორკშოფს. ამ ვორქშოფებით მას სურს რეალური ცხოვრების და სახელოვნებო საზოგადოების დაკავშირება. შეკრებილ ჯგუფთან ერთად მას ასევე სურს იმუშაოს იდეების განვითარებაზე და ჩაატაროს “brainstorming”, რაც ვირტუალური პერსონაჟების შესაქმნელად იქნება საჭირო. ჯგუფთან ერთად შეიქმნება “ახალი მხატვრები”, ან “განსხვავებული მხატვრები”, “დავიწყებული მხატვრები”, “მომავლის მხატვრები”, “უარყოფილი მხატვრები” და ა.შ.…შეიქმნება მათი ბიოგრაფიები, მათი ნამუშევრები, მათი წარმატება, წარუმატებლობა და ყველაფერი რაც კი შეგვიძლია მხარტვართან დაკავშირებით წარმოვიდგინოთ. პროექტის შედეგი იქნება ინტერნეტ ინტერფეისი, რომელიც წარმოადგენს ხელოვნურად შექმნილ მხატვარებს (საქართველოდან). პროექტის დამთავრების შემდეგ გაკეთდება პრეზენტაცია სადაც დიდ ეკრანზე, ეს პროექტი იქნება განხილული მარტინეს და ამ პროექტზე მომუშავე ჯგუფის მიერ. პროექტში ჩართვით დაინეტერსებულმა პირებმა გთხოვთ მოგვწეროთ იმეილზე: infogeoair@gmail.com , იმელის სათაური (subject): Artificial Artists. მარტინე ნედამი [http://neddam.org] თავის ხელოვნებაში იყენებს “სიტყვას” როგორც დაუმუშავებელ მასალას. მისი საყვარელი მიმარულება სიტყვიერი ქმედებები და საზოგადო სივრცეში განთავსებული სიტყვებია. 1988 წ-დან იგი ფენს ტექსტებს როგორც ობიექტებს (ბანერებს, პლაკატებს, ჩრდილებს კედელზე) მუზეუმებსა და გელერეებში. მას ასევე განხორციელებული აქვს მრავალი დიდი შეკვეთა საჯარო სივრცეში ევროპის სხვადასვხა ქვეყანაში: ჰოლანდია, საფრანგეთი, დიდ ბრიტანეთი [http://neddam.info]. მარტინე ნედამი ასევე არის პროფესორი ვიზუალური ხელოვნების განხრით რიტფელდის აკადემიაში, ამსტერდამი, სადაც იგი 1994 წლიდან ცხოვრობს. მას რეგულარულად იწვევენ UQAM-ში (კუებეკის უნივერტიტეტში) მონრეალში, სტუმარ პროფესორად. 2008 წელს მან ჩაატარა სამაგისტრო პროგრამის სპეციალური კურსი ვირტუალრი პერსონაჟების შესახებ. 1996 წ-დან იგი ქმნის ინტერნეტ ვირტუალურ პერსონაჟებს, რომელებიც დამოუკიდებელ არტისტულ არსებობას ეწევიან. ამ ვირტუალური პერსონაჟების მიღმა რეალური ავტორი არ ჩანს. დევიდ სტილი [http://davidstill.org] 2001 წელს შეიქმნა. იგი მომხმარებელს საკუთარ იდენტობას და იმეილს თავაზობს, რითიც ყველა ვებსერფერს შეუძლია ისარგებლოს. ხიაო ქიან შეიქმნა 2006წ-ს. ეს არის ჩინელი ხელოვანი რომელიც ვირტუალურ პერსონაჟებს ქმნის [http://turbulence.org/Works/XiaoQian/]. First workshop - October 19th, at 18.00. Second workshop - October 23rd at 18.00. 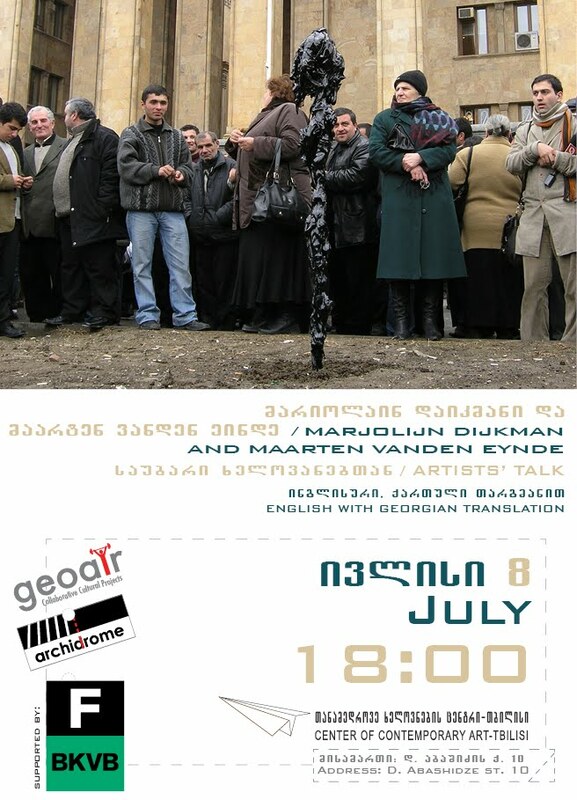 In her project, Martine Neddam wants to react to the situation in Georgia. In the time when all the young artists want to live abroad, why not "create" some new artists virtually, making use of available information from GeoAIR archive? At the GeoAIR residency, Martines first step will be to connect with the local art scene, artists, students, art lovers, and also to the internet community, bloggers, and social media. She will make workshops for the group of Georgian people using her interface http://virtualperson.net. It is a website she created 4 years ago, an online tool made to assemble texts and pictures in order to create a virtual character. The interface is very easy to use and accessible to anybody familiar with a computer. Workshops like these are a good way to make real life contact with the art community and brainstorm together or individually and trigger the imagination on the idea of "another person", while gathering and publishing digital material which can be viewed online. Together with some people in Tbilisi, New_Artists, or Different_Artists, Forgotten_Artists, Future_Artists, Future_Artists, Neglected_Artists, etc will be created. They will also have their biography, the documentation of their works, their success, their failures, and whatever one can imagine about artists. The results of this project would be an online interface presenting the Artificial_Artists (of Georgia). After the project is finished, there will be a live presentation with a big screen, where the Artificial_Artists would be reviewed and commented by Martine Neddam and those who have made them. Pelople who are interested to participate are asked to contact us: infogeoair@gmail.com. Subject of an email: Artificial_Artists. Martine Neddam is also professor in visual arts at the Rietveld Academie in Amsterdam where she lives since 1994. In Montreal at the UQAM she is regularly invited as guest professor. In 2008 she gave a special course in the Masters program about virtual characters. Since 1996 she created on internet virtual characters who lead an autonomous artistic existence in which the real author is never disclosed. David Still [http://davidstill.org] who was created in 2001 offers his identity and the use of his email account to all the passing websurfers.